I am one of the riders who not only wants to hear my motor, but ensure others can hear me when its necessary. The NH series is not as loud as I expected, but it is an aggressive mufffler with a solid growl. Performance is better than I expected and when you twist the wick, it responds very well. This is an outstanding product at a very good price. Great pipes for a great deal! DK shipped them fast. The pipes are beautiful, I have had them on for 2 days and have gotten a lot of compliments. They gave a deep growl, deeper than VH. You will have to turn your stereo up but the pipes are not obnoxious. It's a loud that you feel in your chest not a loud that hurts your ears. My head pipes are oem. The slip-on mufflers were a breeze to put on. The sound is exactly what I wanted. It's very loud but not too loud(will be heard like the saying goes loud pipes saves lives.) I would highly recommend these cobra NH Slip-on!! Also the delivery was very very quick, I would definitely order from Dennis Kirk again a customer for life. 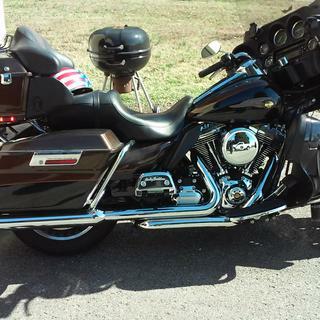 You can hear me coming, and also makes the Road glide Ultra look nice, I've had all kinds of pipes and Im talking namebrands pipes these are probably the best I've ever had. These slip ons are simply amazing. Great sound for a fraction of the cost. Matched them up with the Fi2000 fuel programmer and high flow KN air intake...unbelievable. Shipping was quick and packaging is top notch. 2009 Harley Davidson Ultra Classic super easy install. Fuel programmer directions said to prop up the fuel tank with block of wood so you can get at injectors...Don't waste your time, take the tank off. This is how a Harley should sound, slip ons are truly amazing. Sounds great, pleasure doing business with you.looking forward to my next purchase. I was looking for good looking pipes and a deep rumble sound. I got both in the Cobra NH. And Dennis Kirk was great; on price and speedy delivery. Very happy with this purchase. 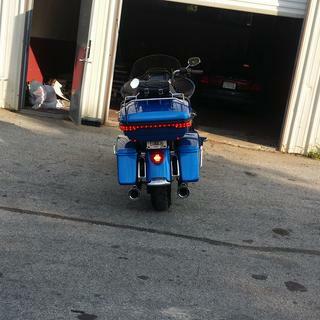 Just put a pair of Cobra Neighbor Haters on my 2012 Tri Glide. They were an exact fit. No problem putting them on. Seems they go out of stock pretty fast. I was notified in about a week they were in stock and in less than a week I had them delivered to my door. Look good sounds good I’m happy! They look and sound GREAT!!! Not very organized and apparently no supervisors work on the weekend (the customer service guy was sleeping). said they weren't in stock. I found out they don't use "real time" inventory control. I was P.O. I called a third time and got a lady who was slightly better. didn't guarantee when I would get them. 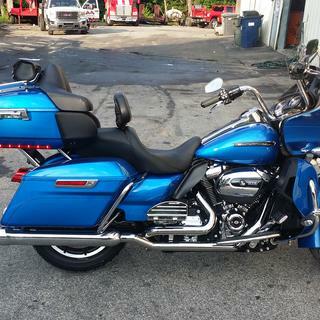 I replaced the stock exhaust pipes on my Harley davidson road king. Big difference, love it. very nice easy to install has more power now, had wild pigs . I also have the Cobra powerport headers on my bike and with these mufflers it is definitely LOUD. Great sound! Much louder that the generic slip on's I had on my Road Glide, but thought they would have a deeper sound, over all, I am satisfied with them. Just what I wanted, awesome product! My bike now sounds like a Harley-Davidson! Great low rumble. Easy to install and great to ride with. Looks even better on than I had thought. Honestly bought for sound, but now that they are on they look amazing. These slip ones are awesome! I waited nearly two years to replace the stock mufflers. 2016 Streetglide bone stock ... except for the Neighbor haters. 20 minute install, fit and finish flawless, fast shipping! They fit the bike very well, was worried about them sticking out to far past the bags, they are perfect! Now the Sound...holy sh!t Batman, these pipes rock very deep rumble and tone at idle and through the rpm’s. When I’m running between 2500 and 3500 rpm’s on and off the throttle they produce awesome sound! Deep and strong but not to loud. Perfect I wouldn’t want it any louder, but Everyone definitely knows you are there! Sound is better than a lot of other pipes that cost twice as much! Best 350 bucks I’ve ever spent on a bike. Rolling Thunder! Sound is perfect to me... its louder and deeper at idle and pretty loud when you turn it up to 3000rpm or more. Sounds just as good decelerating to! I wouldn't want it any louder ! Some guys are surprised when they find out the baffles are in. They look awesome the perfect length! Cobra has been in the business for years. Excellent product for the price. COBRA how could you go wrong. Dennis Kirk., outstanding. Ordered on Saturday afternoon and the package was deliver by noon that Thursday. Very satisfied. Bought these last week, finally installed and the sound is as good as I expected. Fast delivery from Dennis Kirk at a great price. Installation was a breeze less than an hour. Very Happy. Look good and sound great!! Very pleased with the product gives the bike a great look sounds awesome loud not too loud that it hurts your hears. People know your coming! a nice deep rumble . Awesome! IT LOOKS GREAT AND SOUNDS AWESOME! I put these on a 2016 ultra classic without changing anything else at all. The sound is a deep rumble but not overbearing loud. They do have a removable baffle to make them louder. The finish is flawless and they came well packaged. I am very pleased. These pipes look very nice with the 4 inch oval. They have a deep growl but aren't as loud as I thought they would be. Your neighbors wont really hate you unless they already do. The slip on mufflers were well priced. They were easy to install, look great and sound even better. They have a deep, throaty rumble that I love. These slip on mufflers are deceiving. At idle or just cruising down the highway, they are louder than stock, but not overbearing. Then you twist the throttle, and WHAM, the noise level just about splits your eardrums. So so so happy with them. I put then on with some Bassani true dual headers that allow the use of '16 and earlier mufflers on the M8. Now I can hear my bike "stereo" !!! Awesome sound, awesome finish. Do yourself a favor and pair these up with a set of true duals. Incredible sound without being obnoxious. I have a fuel tuner and it sets up nicely. I would definitely recommend them for anyone who wants a quality exhaust. They are not to loud and not to quite I like them a lot. 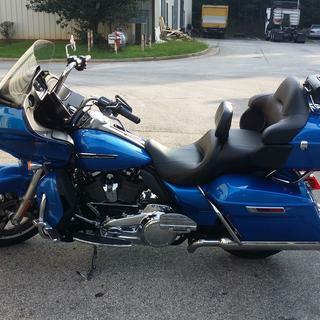 Has the Harley sound I was looking for for my 14 street glide and at a good price. Customer service with Dennis Kirk was also great. Great pipes! Sound amazing. Customer service was great. Highly recommended! Super nice pipes!!! Haven't tried taking the baffles out yet to see how loud they can be but they have a deep bellow sound with baffles. Thanks Dennis! Nice looking and awesome pipes. Very loud. Totally meet my expectations. If you are looking for loud. Its the rite pipes for you. They seem to be well built. are these the loudest slip on you sell for a harley bagger? BEST ANSWER: I would guess not but performance is the name of the game and these perform well. Also they do have a rich deep tone especially when winding up the R's. Customer was extremely happy. One other consideration, Cams make a huge difference in sound. I have NH's on my 2010 ultra and with 204 cams and a Bansani 2 1 2 its LOUD! Deep solid and incredible as the RPM come up. They can be. The baffles are removable but that voids the warranty. I have a full Rinehart system on my '06 Ultra Classic. Will these just slip on my head pipes ?? BEST ANSWER: Always measure across the center of your header pipes for size. These would not fit my Bassini power curve pipes. (Mufflers smaller). But I bought Cobra header pipes before I bought mufflers. I can not answer this question, I slipped mine on my HD original header pipes. Not sure but i had stock and the slip ons fir perfect. I would say yes . It should be a standard size. Is it necessary to tune after install? Yes if you have carbs. Self adjusting if fuel injected. Do you have to recalculate the computer? is this from heads back or is it just mufflers? They are just mufflers. I'm very happy with the sound. No its not, but they sound great! Do I need to change anything else if I use these pipes? BEST ANSWER: Nope. These pipes are great. Take the stock one off slide these in. However I would suggest a high flow air filter to go along with it if you do t already have one. No. I put these on a 2016 ultra classic and didn't change anything. They have the sound I was looking for and also have a removable baffle. Yes you will need a good automatic fuel contoller to keep from having a flat spot,the sound and power is excellent. Can the tips be changed? BEST ANSWER: No the the body of the mufflers are one piece with a bell shape on the end. Hope this helps, they sound great! No the pipes are all one piece. I have a 2013 ultra limited with stage one air breather, will I need anything else for these to fit??? BEST ANSWER: Not sure, I got a set for my 2016 freewheeler. Took off the existing muffler and slipped the neighbor hater's right on. They should slip right on for ya, they look good and sound great. '15 UL here. No, you’ll be loud and proud real soon. 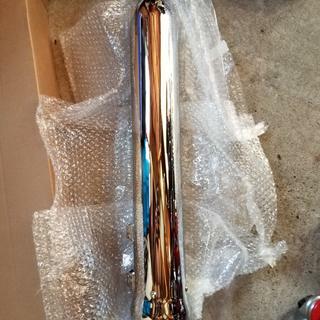 Do the Cobra NH series mufflers have an indentation for the shocks on both mufflers? BEST ANSWER: Hello, there is an indentation on the right side only. by the way, they sound Awesome! No just the right side if sitting on the bike. I think it was only on one of them. will they fit 2017 tri glide? BEST ANSWER: They fit my 2019 trick glide. 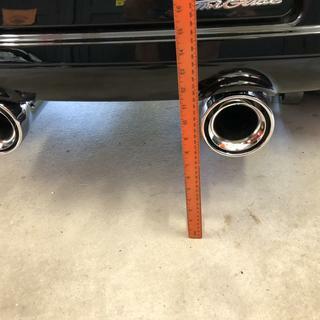 The box said up to 2016 but they were the exact same length as my factory exhaust. I have no idea. I bought them for my 2013 Ultra Limited and haven't even put them on yet. What improvement do you see in regards to horsepower and torque? BEST ANSWER: I bought them for my boyfriend and he isn’t sure how to answer that because we had the bike dyno’d right after.. I can tell you that it made it a lot louder and sound cool as heck!! No loss noticable in either but I have not had the bike dyno'd again since installing these mufflers. Do the Cobra Neighbor Haters have the Cobra emblem etched on the Mufflers? BEST ANSWER: Yes they do. And I am vary happy with the NH pipes. I have a 2011 (flhtcu) Ultra Classic with Vance & Hines exhaust with shark tails. will the NH fit the Vance & Hines pipes? 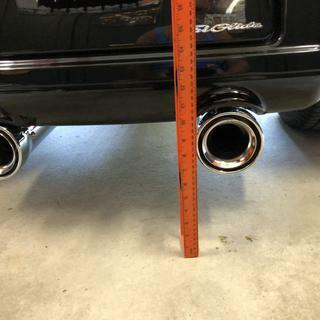 will these fit 2019 road glide ultra? BEST ANSWER: I don't know mine went on a 2007 electiglide classic sound & work great. I have extened saddle bags will they still fit? Will this fit a 1994 FLHTC? All I could find was the black set that fits my bike but I'm looking for the chrome set. Are these the same pipes diameter and mounting wise? Will I have to remove the body on my 2016 Freewheeler to install? Can they be installed from underneath the bike? Are the baffles removable? Or are they welded in? Do they still sound great with the baffles removed? I’m assuming they get even louder?